Tax preparation is a process that is fraught with pitfalls and those who are not careful can fall victim to them. The worst part of all is that it is impossible to avoid certain landmines until it is too late. One of the most common problems that people come across during tax preparation is the proliferation of tax preparation software. While this software typically claims that it will make tax preparation easier, this is not always the reality. Read on to learn more about why you should avoid tax preparation software. Tax preparation software is not an exact science and the world is filled with people who decided to take the easy way out when it was time to do their taxes. The IRS does not care one iota about your accidental mistakes and they will audit a filer expeditiously, regardless of what tax preparation software they've used. Audits are incredibly painful and it can take years to undo the damage caused by one errant tax filing. An audit is the financial equivalent of having every last piece of your dirty laundry aired for the whole world to see. Your wages could end up being garnished and you will likely end up spending far more money than you saved to dig yourself out of the mess you've made. Let's say you manage to get through the tax preparation process by using software and you also somehow manage to avoid an audit. However, no piece of tax preparation software is ever going to look out for you the way that you look out for yourself. Those who decide to use tax preparation software often find that they have left thousands on the table in potential refunds by trusting their software implicit. Technology is never infallible, but that does not stop people from flocking to in droves. But when it comes to tax preparation, there is no substitute for the watchful eyes of a human being. Preparing your taxes by a tax professional can be done by email or fax, it allows you to save a great deal of time. According to IRS estimates, the average person needs at least 22 hours to prepare their own return. This figure rises for those who own their own business or have rental properties and preparing your taxes by a tax professional by email or fax is the best choice. While preparing your taxes by a tax professional, in person, by email or fax can cost money in the short term, in many instances, you will be able to write off the money spent on preparing your taxes by a tax professional on your tax return. One of the many, many benefits of preparing your taxes by a tax professional by email or fax is increasing your understanding about federal regulations and loopholes, which are changing on a constant basis. Preparing your taxes by a tax professional grants you access to the latest developments in tax law. If you are audited by the IRS, preparing your taxes by a tax professional allows them to represent you. When the IRS has any questions, you will not be forced to answer them on your own. Only Enrolled Agents, CPAs or tax attorneys can represent you before the IRS and state tax agencies. Our firm can professionally prepare all kind of tax returns; we assist our clients in person at our office, or by email and or fax. 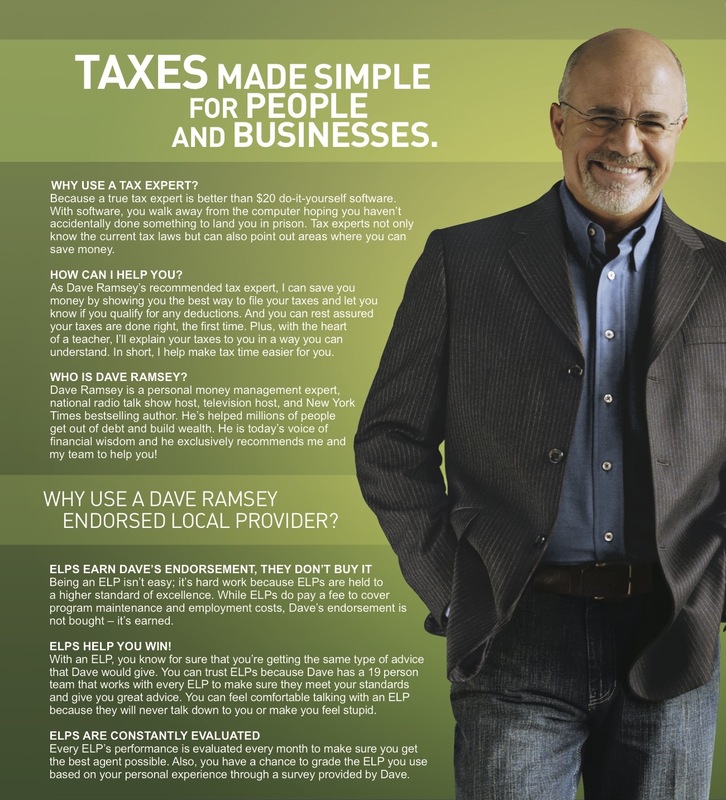 We are A+ rated by the BBB better business bureau, and we are an ELP endorsed local provider of Dave Ramsey. Call us today at 1-877-78-TAXES [1-877-788-2937]. NOTE: Tax preparation software such as TurboTax, TaxAct, TaxCut are registered trademarks and owned by their respective owners.